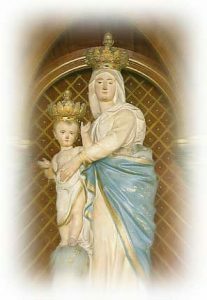 In the year 1896 (Meji 29), the replica of the statue of “Our Lady of Victory”was donated by “Notre Dame de Victoire”Church, parishioners of Paris, France, with whom the then parish priest, Fr. E.BOEHRER, M.E.P. was significantly associated.This Statue is at present placed in front of the entrance , which was located in the upper side of the altar at the time of the red brick church and the wooden church.